While this ocean scene may look like a simple coloring page (and it can be used in that manner), this picture can be used in a couple of different ways and makes a great addition should you have an “Under the Sea” theme. Kids have always loved coloring, whether it be on a coloring page or plain paper. It's fun, however, to introduce a new element to basic coloring once in a while. That's what this coloring page does. For the kids it's not "just coloring", it's a project. 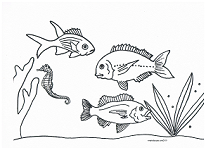 Have the children color the ocean floor, plants and fish in bright colors. Then, have the children paint with blue watercolor paint over the entire page. Let dry completely. This will make the colored parts much brighter. OR… instead of paint, dip a cotton ball in baby oil (or vegetable oil) and rub oil over the entire picture. Make sure the picture is fairly wet. Let dry completely. We let ours dry overnight. This will make the un-colored parts of the picture look transparent. OR... for a simpler way to create water and have less mess, print the picture on light blue paper, and have the children color the ocean floor, plants and fish. However you use it, the pictures will look great displayed in a bright sunny window, on a bulletin board, or as a wall display. *You can also use the blue paint concept to create a sky with other coloring pages.